Our farm is a little over a half-acre of vegetable and fruit crops, tended by the Cedar Ridge community. 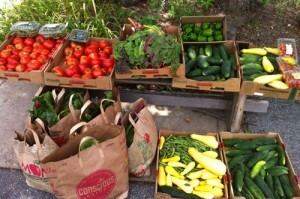 Each year we grow well over a ton of organic food, which is given to local groups that serve the hungry and homeless. Although Maryland is the wealthiest state in the US as measured by median household income (and Montgomery County is the second wealthiest county in Maryland) poverty and hunger are widespread and growing problems. 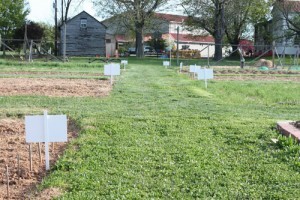 In addition to providing food to neighbors in need, the farm is a way for us to take a stand on the issue of hunger. Through the farm we form alliances with other groups working on this issue. We sow, weed, water, harvest and give our time and toil because people who are often marginalized in our society are incredibly precious to God and matter deeply to us. We also realize, as we serve together, how immensely fortunate we are—with food and health, with land and resources, and with a loving community. During the growing season, we have regular work days (Thursdays from 6 PM onwards, and Sundays from 8 AM) led by a member of the farm team. You can also help on other days by checking the task list on the back of the farm shed door. You don’t need to have gardening experience, or be a church goer – all are welcome and appreciated. SSL hours are available for middle and high school students. 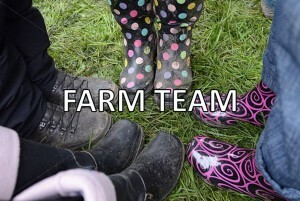 If you are new to the farm, or if you have questions, email the Farm Team. Sign up to help on the farm here! 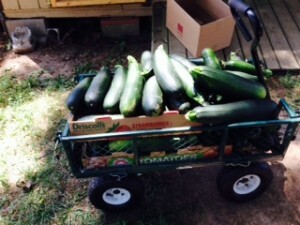 Farm produce is distributed to a number of groups working with the homeless and hungry in our local community. This year, we are distributing most of the produce to families in need in partnership with Manna Food at two of their distribution sites, as well as to Shepherd’s Table. To help with distributions, sign up online, or send us an email to find out more. Come and be a part of bringing veggie-happiness to our neighbors in need. Thanks in advance! Check out Stories from the Farm!